I’m always looking for good crockpot recipes. I threw this in the crock one morning before we left for the day. Unfortunately I didn’t get to taste it that night, but the husband did. He said it was good and spicy. I tried it a few days later reheated. It was ok but probably tasted better fresh. I served it over jasmine rice. Cut pork into 2-inch pieces. Season with salt and pepper. Heat a large non-stick skillet on high heat; when hot lightly spray the pan with oil and brown the pork over medium heat on all sides, about 3 – 4 minutes total. Sprinkle 1 tbsp of flour over pork and stir to cook 30 seconds, sprinkle remaining flour over pork and cook an additional 30 seconds. Add browned pork to the crock pot, along with the remaining ingredients. Cook on LOW for 8 hours or HIGH for 4 houts (if using a Dutch oven, cook on low heat for 3-4 hours). When done, adjust season, salt and pepper to taste if needed. I had a pork shoulder roast, a HUGE pork shoulder roast. So, I knew there would be leftovers. 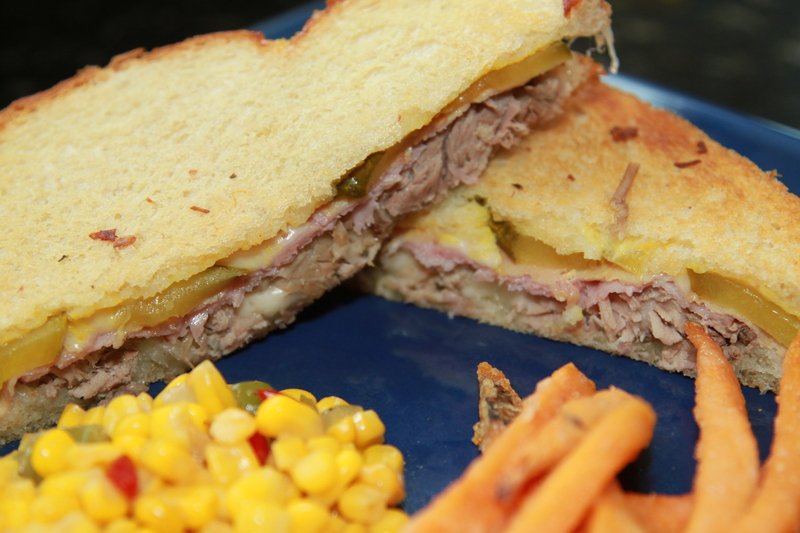 When I was deciding what to do with it, I went ahead and just decided to make 2 dinners with it and went with Cuban. adapted from elly says opa! I had every intention of doing this in the crock pot, it’s the perfect recipe for it. However, the HUGE aspect of the roast meant it didn’t FIT in my crock pot. So, I roasted it in the oven on 300-degrees, covered, for A LOT of hours…until falling apart and deliciousness set in! You SHOULD rub all the ingredients all over the meat, wrap in plastic and let it marinate overnight, but I didn’t. It cooks long enough in some pretty hefty flavors that it was still flavorful. Really, I find with a nice bone-in pork roast that sometimes even with just a bit of salt and pepper, it is still delicious. Outside of a great rib-eye, and a perfectly marinated flank steak… I love no other meat as much as I LOVE pork! The first night I did the pork as tacos. The kids did burrito style with the beans and everything in a tortilla. 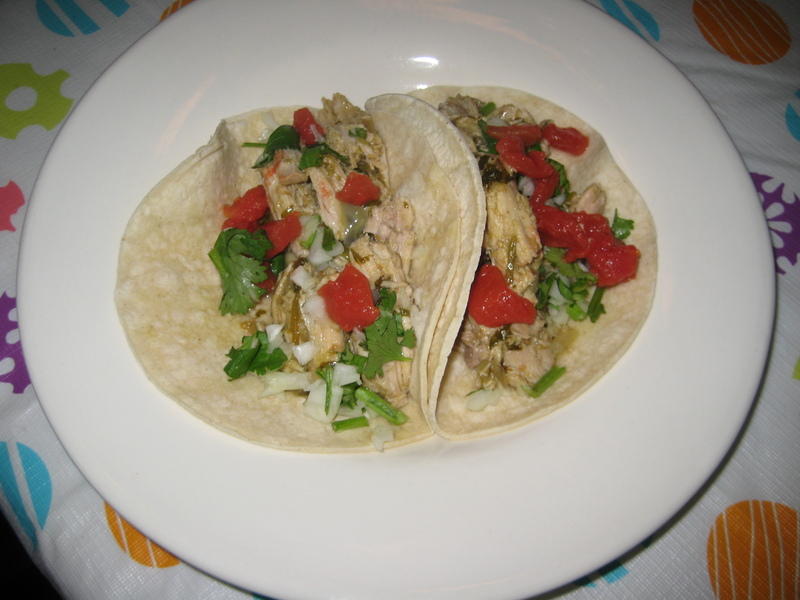 They aren’t fans of corn tortillas so they used flour, added a bunch of fixins and ate seconds. Hubby and I went for the taco route, simple and yummy. I like corn tortillas and when I don’t have time to get down to the Mexican market for homemade, I like these hand-made style corn tortillas for soft tacos. The meat is versatile enough you can do just about anything with it (to be honest even after 2 dinners there were still leftovers so I made a pan of green chile enchiladas with it and took that over to a friend who needed some “care”). I’m tellin ya….HUGE pork roast! Have some fun…use your leftovers! We love pork around here. It is the other white meat after all :). This was delicious!! You all should make it soon. When I chopped up the jalapeño I didn’t discard the seeds, but threw them in as well. So this had a really nice kick yum! Don’t forget the scallions either! Place pork, soy sauce, vinegar, water, garlic, pepper, jalapeño, and bay leaves in the crock pot; cover and set to low heat 6 to 8 hours turning over half way through cooking. Remove the pork, shred with two forks and put it back in the crock pot for one more hour to let the flavor get into the meat. Discard bay leaves and serve over rice and top with chopped scallions. i really had low expectations for this one. a pork loin, some salsa verde and a little lime juice?? well i was wrong — this came out really good — and of course the cilantro added a ton of good flavor! unfortunately i didnt have fresh tomatoes, so i drained some canned ones really well instead. 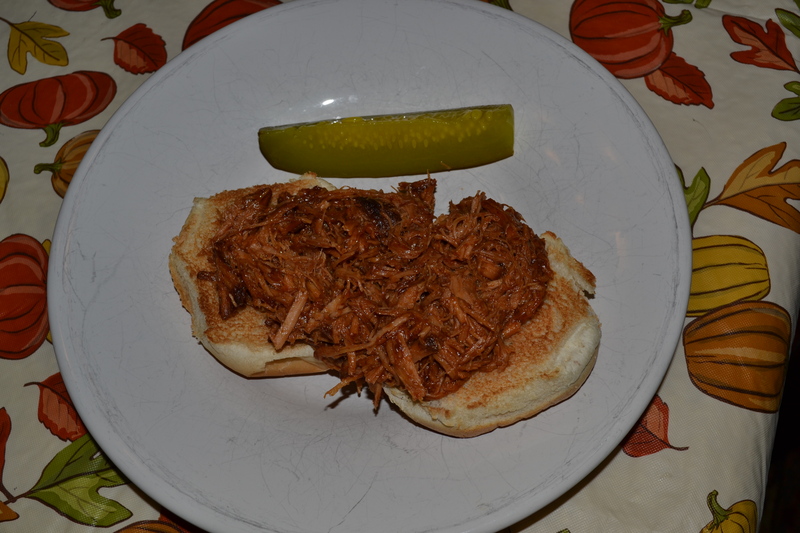 Place pork roast in slow cooker. Mix together salsa verde and lime juice and pour over roast. Cover and cook on low for 7-8 hours. Meanwhile, mix together onion and cilantro in a small bowl; refrigerate. 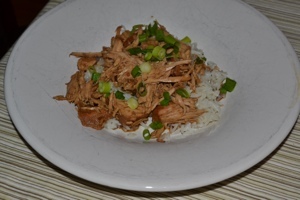 About one hour before serving, remove pork from slow cooker and shred with two forks. Return to slow cooker, and stir in about 1/2 cup of the onion and cilantro mixture. 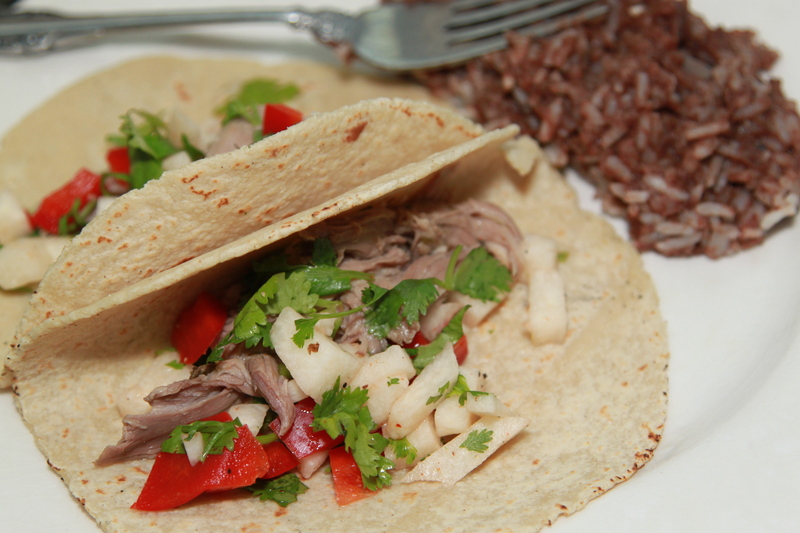 To serve, place pork mixture into tortillas. Top with onion and cilantro mixture and chopped tomatoes. i made this dish originally back in june and had said next time i would make some changes — so this time i did! here is the recipe with the modifications i made! In a large skillet, heat 2 tablespoons olive oil over high heat, swirling to coat the pan. Add the pork to the skillet in an even layer and season with the chili powder, cumin, garlic powder, 1/2 teaspoon salt and 1/4 teaspoon pepper. Cook, stirring, until just brown all over, 2 to 3 minutes. Transfer the pork and any juices to a plate. Add the remaining 1 tablespoon olive oil, the bell peppers, corn, black beans and finely chopped scallions to the skillet and cook, stirring, until crisp-tender, about 2 minutes. 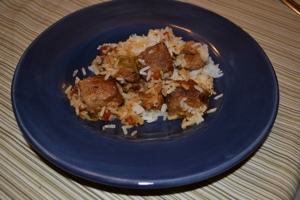 Return the pork and any juices to the skillet and cook, stirring, until heated through, about 1 minute. Stir in the sliced scallions. This week Victoria asked me if I had some pork to cook — of course I did… and pork in the crockpot is super easy and usually turns out delicious! this was no exception it was REALLY REALLY good! definitely use some cilantro and scallions as toppings! the spinach didn’t add too much flavor to the meal but was a good way to sneak in some veggies! 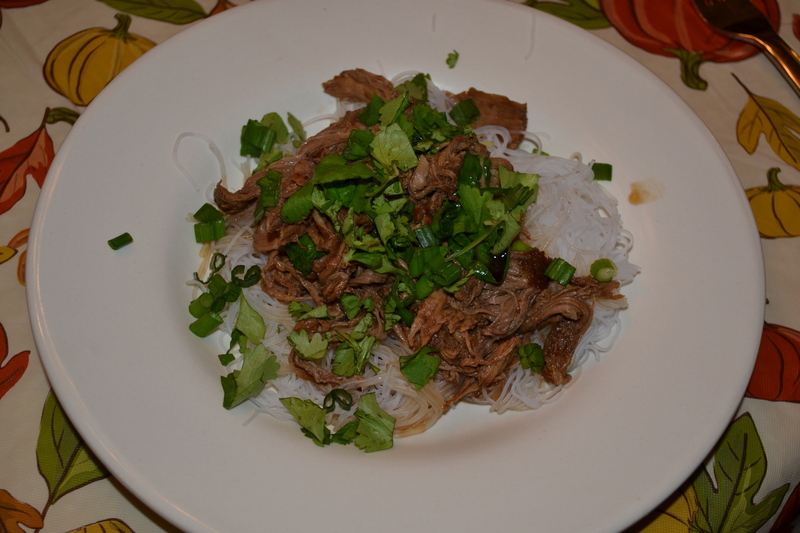 I served the pork over rice noodles. we’ll definitely be making this again. BUMPKIN’S NOTES – I made this last night, for guests (but didnt’ take a photo). It was a hit with adults and children alike. I didn’t add the chili during the cooking because of the kid factor, but served it with Sriacha sauce and it was DELICIOUS! I added some left-over veggie tray veggies (carrots, snap peas and brocolli), in addition to the mushrooms and spinach. Served over rice. This meal WILL be making another appearance in our house. Also, I concur with Townie – the fresh scallions and cilantro are a MUST! Season pork on all side with salt and fresh cracked pepper. Heat a skillet on medium-high heat, spray with a little oil and brown the pork on all sides for about 7 – 8 minutes. In the crock pot, combine the broth, soy sauce, balsamic, sugar, sesame oil, Chinese five spice, garlic and ginger; add the pork and set the slow cooker to 4 hours on high. remove about 1 cup of the broth and reserve if needed. When done, shred the pork using two forks. Add baby spinach cover a few minutes until it wilts. Place the pork tenderloin in a slow cooker; pour the root beer over the meat. Cover and cook on low until well cooked and the pork shreds easily, 6 to 7 hours. Note: the actual length of time may vary according to individual slow cooker. Drain well. Stir in barbecue sauce. Serve over hamburger buns.